This has a blue screened pantograph background on the front side and a white backside. 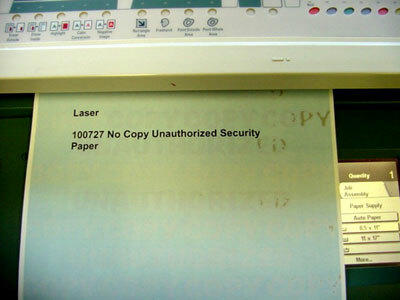 The word "VOID" appears on duplicate color laser copies and scans, as well as black and white laser copies, faxes and scans. Cutting die required. Pick one of our 3,000+ dies free of charge or create a new die. No die required for blanks. Minimum order of 2500 sheets. Please contact us for perforation, scoring and die cutting requirements.